A Home Theatre production on stage at the Aitkin Opera House. Vaudeville acts, lantern-slide presentations, home theatre productions, high school plays, lectures and ballroom dancing were the typical fare of Aitkin Opera House offerings. The opera house was located on the second floor of the building. It featured folding chairs as seating that could be removed for ballroom dancing. The walls were covered to window sill height with oak paneling that Sam Hodgeden had manufactured from oak cut near Aitkin. The panels were milled in Little Falls, numbered as to placement and shipped back to Aitkin for installation. The new opera house sported a ticket window, men’s and ladies’ lounges, and dressing rooms. The expansive stage was trimmed with oak carved in ornate floral scrollwork and was accented with Roman-style pillars. The Aitkin Opera House remained in use until just before World War II. After the war, it was used as a furniture store for a few years and later was the first home to the local American Legion club. As fate would have it, the Aitkin Opera House stage became a springboard for careers on the silver screen. One such performer was the youngest of a vaudeville trio from Grand Rapids called the Gumm Sisters. This vaudeville act performed in theatres around Minnesota and surrounding states. Appearing on stage was three-year-old Francis Gumm who would mature and become Hollywood’s Judy Garland. Judy Garland returned to Aitkin again shortly after her most memorable role in the Wizard of Oz, during a return visit to Grand Rapids. She made a point to visit the former place of employment of a fellow MGM star and former performer at the Aitkin Opera House…Warren William. Warren William as "Perry Mason"
A youthful Warren Krech was not content helping out in his father’s newspaper, the Aitkin Age. He dreamed of a career on the stage, and enjoyed hamming-it-up to local audiences in every home theatre role he managed to get at the opera house. Later, Krech would end up in Hollywood as one of MGM’s hot properties (along with Judy Garland). Krech changed his name to Warren William and played many starring roles. 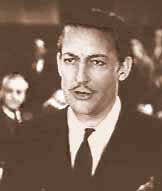 He was the original Perry Mason. He played Marc Anthony in Cecil B. DeMill’s epic Cleopatra., and was in the original Wolf Man .film, just to mention a few of his notable roles.